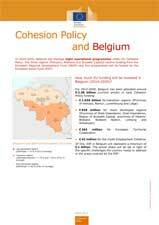 In 2014-2020, Belgium manages eight operational programmes under EU Cohesion Policy. The three regions (Flanders, Wallonia and Brussels Capital) receive funding from the European Regional Development Fund (ERDF) and five programmes are funded by the European Social Fund (ESF). How much EU funding is invested in Belgium (2014-2020)? Of this, ESF in Belgium represents a minimum of € 1 billion. The actual share is set in light of the specific challenges the country needs to address in the areas covered by the ESF.